Yesterday, I was washing my face in the basin and there was this annoying housefly buzzing around. 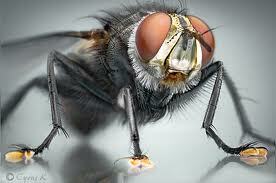 I am normally tolerant of 'annoyance' but this housefly was aiming for my face. I decided to tell my house maid later to get rid of it (which she understands as kill it). I got dressed and came to the bathroom and saw a black spot on the wet floor. It was the same housefly. I bent down surprised how it had been suicidal enough to land up on the wet floor. I don't know how it did it, but it was stuck on the wet floor wings down and waving its legs in the air frantically trying to lift its wings off. I had wanted to get rid of the housefly, and here it was on the floor near dead, my job half done. But...... I could not turn away. I could not turn away from a life form, that was near dead, struggling to live. I could not turn away from the tiny life of a housefly with a big will to survive. I could not turn away knowing that I was the only help that it had, to live. So here is what I did - I put the tube of my face-wash next to its legs, so it got a grip. The fly climbed onto the tube. Then I left the tube by the side of the basin so it could dry off and fly away, or buzz around my face annoyingly in the evening. I could not shake off this incident the whole day. It was my "wont" against the housefly's "will". Life is like that.... no matter how much we think that the other person will get annoyed enough with us to get rid of us, in the end, its our own will to survive that shapes the final call. My friend, now a successful businessman, had no money or industry support. He had "wont work" as advises from everyone he turned to. But his will was so strong, that today, ten years later he not only owns one of the biggest fashion brands in the country but also has in his list of supporters and colleagues, the same people who had attempted to get rid of him in his early days. My lesson for the day came from the house fly. It's will to live was stronger than my agenda for it to die. That is true for business, that is true in relationships, that is the truth you find everywhere you go. "Will" "Intention", whatever you call it, is the primary reason for all that happens to you. If our daily intentions and willingness is aimed towards success and progress, the universe has no option but to comply. Now that we are talking about “Purpose”,,,,, a lot of thinking comes out of the closet. Just because you are doing ‘something’ or headed ‘somewhere’ does not mean that you are on the path of your purpose. You could be working for twenty five years without a clue about your purpose at work or generally in life. So how does one find one’s purpose? By finding the real reason why you are doing what you are doing? Here is how I helped one of my colleagues and you can see if the following serves any good for you. ‘So why are you doing this job? – Because it pays my bills. See this was my point. A lot of people mistake duty and responsibility to be their purpose. Purpose is a personal thing. It is that force that drives you, that motivates you and inspires you. It’s beyond duty. It’s beyond responsibility. It is your soul’s desire for creation. ‘So why are you doing this job? – Because it pays well. No. Why are you doing this job and not any other job? – Because I got selected for this one! If you had a choice, what kind of job would you prefer? – Ummmm, if I had a choice, I would be a musician. I love to play music. But I gave it up because I got this job. Now we made some massive headway. Continue with the why, until you hit upon that reason of love. Continue your search until you hit upon that emotional place that makes you gulp. Your purpose must be your purpose. Your purpose must be your love, your calling, your world that you build in the depths of soul. Your purpose must be that drive which stops time, stops your worries, and opens up a whole new world of possibilities and passion. Your purpose inspires you to think creatively, to find solutions and find in you the perseverance to stay on track. Your purpose adds value to the lives of those who are touched by it. That is your purpose. One thing became clear to my colleague though; he was doing something for which he had no drive, no feelings and no attachment. It was just a job and his purpose was that he had to pay his bills. That was the only reason for him to go to work. Do you think he was creative at work? Do you think he brought energy and drive to make things happen? Do you think he really added value at work? Well, if he had interviewed for a job at my company and if he had mentioned that he was taking up the job to pay his bills, I would not have hired him. His real purpose was to be a musician because he loved to create music. Because when he plays music he adds value to the world. “What is your purpose?” – What would you like to achieve in this lifetime? What would you like to do for your own self? For your family? For the world? “What is your purpose?” – Finding an answer to this question can fuel you with endless energy and drive for a lifetime to see fulfillment! 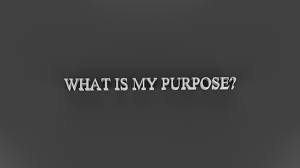 “What is your purpose?”…….. Even if you are doing a job or are preparing for one, it is never too late to wake up to the realization of what you really want to do. And once that door is open, the next step is HOW to get through it. I have a young friend (all of 22 years) and while visiting my home, he sat down and said, "I am so confused Priya, I dont know what to do in my life. There are so many options, opportunities and openings, I am confused." I guess this kind of confusion hits many. Even though this young man is at the start of his career I have seen many seasoned executives often standing at the crossroads of their professional dillema wondering, "What do I do now?" In my opinion, if there was a life changing question, the answer to which would put your actions, your thinking and your future towards progressive evolution, then that question is "Why?" Why is a question that will compel you to look for that reason, that motive behind what you will eventually choose to do. And that reason is your purpose; the purpose behind what you do. So before you ask yourself "What should I do? Or How should I do it?" Stop and ask yourself, "Why should I do that at all?" "Why should I risk in love?" The answer to The Why must give you goose bumps. The answer must make you stand up. If you feel the electricity flowing through your body, if you feel the surge of energy and a sudden burst of well being, then you have hit the correct why, the jackpot that will turn your life around. "Why should I write?" - Because I have nothing better to do - Is not The real Why. It does not excite you. It does not enthrall you. It does not inspire you to get to your table and start playing on your key board. Continue for reasons until you jump out of your chair with the spirit to change the world with your writing!!! Finding the real PURPOSE behind your actions is the real source of power. Purpose will ignite you, it will strengthen your spirit, it will spark your soul, it will fuel you with energy that will prevail for eternity in all the tasks you do. When someone witnesses your work, they will not help but be touched by your purpose. That is power, real power. Stop for a moment, put your pen to rest, put your phone back on the reciever, take your fingers of your blackberry, and think "Why am I doing what I am doing?"